Robert Zemeckis is one hell of an innovator amoung his director peers. He co-wrote and directed the timeless Back To The Future movies, did the animation/live action combo of Who Framed Roger Rabbit?, made The Polar Express, using Tom Hanks to play several roles by means of motion capture technology which does exactly what it describes (animators with a lot of artistic and computer power then wrapping characters around the motion information within its digitally rendered, detailed environments). With Beowulf he took this one step further by shooting the most epic movie using motion-capture to date (and making it for the new 3D theatre environment). With legendary graphic novel writer Neil Gaiman (Sandman) and new generation screenwriter Roger Avary (Pulp Fiction) tackling this ancient Viking folk tale, they consciously took on the role as storytellers, giving the narrative their rendition as done by those who relayed it through the centuries each time it was retold. 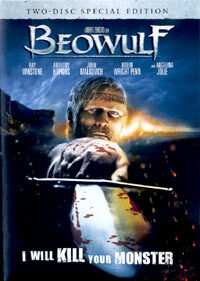 Beowulf is the story of a warrior who comes to the aid of a nation gripped in a reign of terror as a monster attacks their village at night. But there’s far more at work than the surface reveals. Themes of power, lust, betrayal, human weakness, honour, sympathy, secrets and lies accumulate with all of the ingredients for supreme drama – throw in action, violence, sensuality, myth and superb performances from both cast and animation teams, and what you have is a stunning work of art. An extra disc of special features include loads of supplementary material from a look at the origin of the tale (inclusing interviews with the writers), art, design, additional scenes, and a look at the making of the movie, including the workings of the motion-capture system.